For all the negative talk surrounding the future prospects for the economy, the folks working at the high-yield trading desks aren’t listening. Typically, the junk bond market is a harbinger of things to come and is forecasting an economy that is and will stay on cruise control for the foreseeable future. In the chain of events that historically occurs, the bond market leads the stock market both up and down. When yields drop, stocks rally and vice versa. After an initial knee-jerk sell-off when the 10-year Treasury Notes fell below 2.4% and inverted the yield curve with a spread between the three-month bill yield and the 10-year note, the market reflected concern about weakening economic growth in Europe and the eventual implications of that weakness on the United States. The spread, which has been identified by researchers at the Federal Reserve Bank of San Francisco as the most reliable recession predictor, ended the week at zero. The Fed Funds futures market seems confident that the Federal Open Market Committee (FOMC) will not be hiking rates in 2019. Furthermore, the market now reflects rising expectations for a rate cut. The implied probability of a rate cut in September sits at 50.2%, while the implied probability of a rate cut in January 2020 has increased to 76.3% from 39.9% one week ago. This is a dramatic move for the bond market and implies an air of genuine caution by investors about a global slowdown washing up on U.S. shores. Once again, don’t look to the junk bond traders for any measure of fear. While the major stock indexes have recovered 70%-80% of their fourth-quarter losses, the junk bond market is trading up within pennies of the 2018 highs. Either this is just a rush for yield by pension funds obligated to meet yearly pensioner outlays that are harder to manufacture in a super-low interest rate world, or fundamental change is at work. 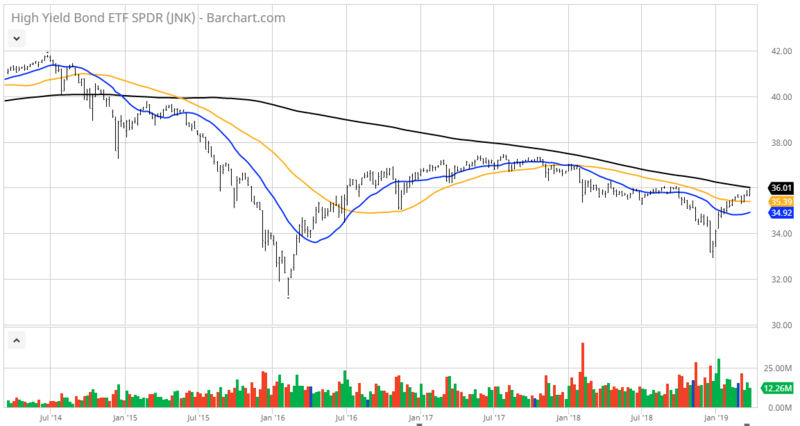 Looking at the S&P Bloomberg Barclays High Yield Bond ETF (JNK), the one-year and five-year charts show how this most widely traded exchange-traded fund (ETF) to be challenging its 52-week high on a short-term basis, but also butting right up against major overhead technical resistance on a long-term basis. From my work, it will take a major push of buying pressure for shares of JNK to clear the old high of $36.32 and break what has been a protracted five-year downtrend. A move above $37 would be enormously bullish for the high-yield universe and usher in a stampede of fresh buyers citing a multi-year technical breakout. 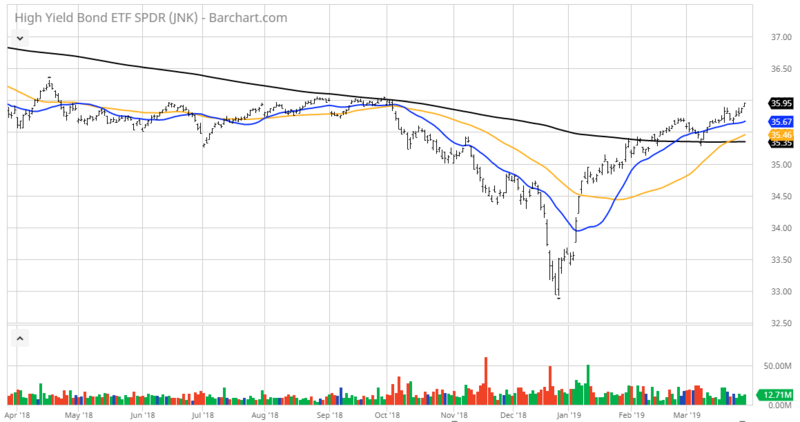 One could argue a wide double-bottom, higher-low formation is in the making that could lead to a bullish move for JNK to the $40 level, based on the technical trend lines. It’s too early to call, but if the shares of JNK do clear $37, it’s a big green light for stocks and especially dividend-paying stocks, which makes perfect sense in a low rate, low inflation and slow growth economy. This could be a terrific story in the making, but I’m not ready to jump the gun and say it’s a done deal. Against this backdrop, rising junk bond prices spell for lower yields across the spectrum and argue well for taking on more risk in high-yield assets. In this regard, my Cash Machine high-yield advisory is positioned very well to benefit from this unfolding scenario. The Cash Machine model portfolio sports a blended current yield of 8.3% or roughly 3.5 times that of the 10-year Treasury and 30% higher than the 5.78% yield of the S&P Bloomberg Barclays High Yield Bond ETF (JNK) shares. The portfolio holds high-yield securities in asset classes that include conglomerates, liquified natural gas, convertible bonds, business development companies, mortgage service rights, private equity, energy refining, alternative clean energy, medical real estate investment trusts (REITs), preferred stock, biotechnology and power utilities. So, not only is the income stream highly attractive, the potential for sustainable capital gains exists. Now is a great time to consider locking in yields at these levels. If the Fed starts to lower rates later this year and into next year, large and small investors will be buying anything offering high yield that’s not nailed down. Click here and learn how Cash Machine will work overtime for your portfolio.